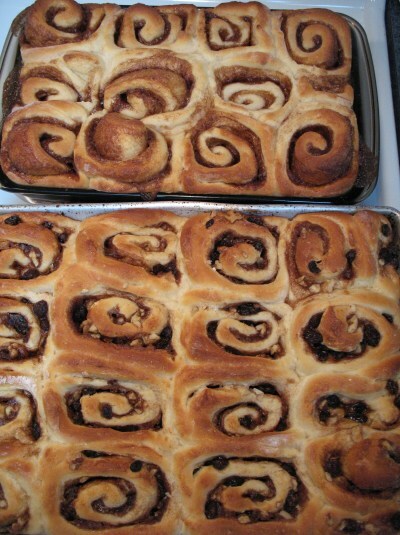 These are the Sweet Rolls I grew up eating. They only made their appearance around the holidays AND whenever we went to the beach, so these puppies have WONderful memories baked into them. And of course, mine aren't as good as Mom's, but they do disappear twice as fast, even though I make a double batch. *wink* It helps that I have twice as many people eating mine than Mom did hers. LoL. We have to make two kinds--one with nuts and raisins and one without. Oh, the cinnamonie scrumptiousness... Guess what I'll be making very very soon? yumz! BUT, while searching for pictures of the flour fight, I DID find some of Mom (not the angel many think her to be!!) 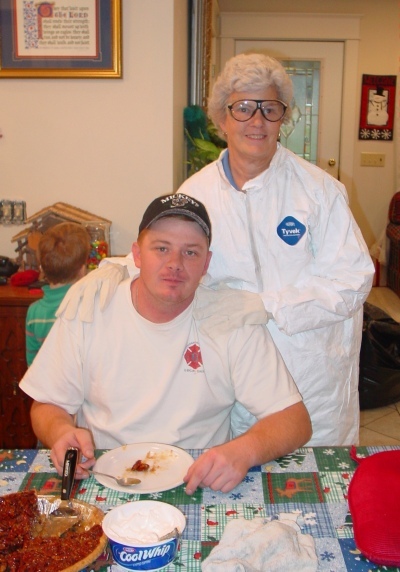 in the hazmat suit my firefighter, germ-o-phobe brother-in-law gave her for Christmas. To go dumpster diving in. Sssshhhhh. It's one of those dirty family secrets. We love to dumpster dive. ;-) And it horrifies my poor brother-in-law (pictured at left *wink*). Bet'cha he didn't know that when he married my sister. hehe. But, as you can tell, he's a good sport and loves his mother-in-law enough to give her a suit to keep her safe while dumpster diving. Huh. I guess I didn't cook myself into a box this time after all. LoL. Didn't get my baking done until today, so I opted for writing about Christmas parties instead. Ya'll do a dumpster dive? That is hysterical. I'd be opting for the hazmat suit! Patty, now you've gone and made me hungry and it's bedtime. Maybe if I wish real hard, after you bake them, you'll send me some through cyber space. I opted for a short Christmas story this week. Oh those rolls look and smell delicious! Love the hazmat suit! My baking story isn't so awesome. Your family is SOOOOO fun and crazy! LOVE this!